Do you prewash fabrics for your quilts? We've previously discussed reasons to prewash fabrics as it relates to the machine quilting you used to finish your quilt top. Here we focus on the many other reasons to prewash or not and how to do it. Just because it's new, doesn't mean it's clean. 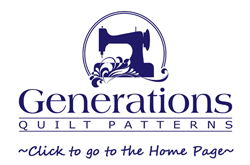 Quilt fabric is usually printed in a foreign factory, shipped in a container on a boat, trucked to your local quilt store, and in many stores, placed on the floor because the shelves are full. Many appliquérs prefer a softer fabric to work with. Removing the chemicals through washing softens the hand of the material. If it is too soft, you can starch it to your preference. If you want a smooth flat finished quilt, prewash fabrics to remove some of the shrinkage so that when your finished quilt is laundered, you will not get that puckered antique look. Different fabrics shrink at different rates (cottons vs. homespuns vs. sateens, etc.) A prewash "equalizes" them. Many prewash to prevent bleeding. While it does remove excess dye, prewashing does not, in and of itself, prevent bleeding. See Bleeding Fabric for more information. Unwashed fabric with its finishing chemical still intact has a crisper hand. It sews and presses better. To produce the soft look and feel of an antique quilt. Unwashed cottons used in a quilt with untreated cotton batting which is washed at its completion will pucker due shrinkage. The finished quilt will never be washed so why bother? Time. It is another step that stands in between you and your finished quilt. The choice is yours. There are no QUILT POLICE to darken your door to enforce any prewash rules. I suggest the following guidelines. Be consistent. Either prewash everything or prewash nothing. That way you'll always know the state of your stash no matter when you acquired it. Use the bleed test to check whether or not any of the fabrics chosen for a quilt will bleed. If one bleeds, then prewash and check again for bleeding. If you determine that it will be a problem, eliminate it from your stash (you don't want to accidentally put it into another quilt). If it's for a child, prewash if for no other reason than to make sure it's clean. In preparing to write this page, I visited my local quilt store and checked the ends of different bolts. The majority of at the quilt store recommended cool water washing, low dryer temperature and gentle or delicate cycles. Some manufacturers went as far as to recommend no heat, no ironing, no drying. This was surprising! I had been washing all quilting cottons in warm to hot water for years and had never paid much attention the washing instructions before. Sort your fabrics to be washed into lights and darks. Set your washing machine temperature to cool or cold. Fill with water to the desired level and add your soap. 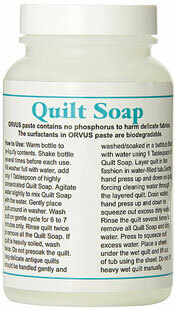 Prewash with a neutral soap like Orvus (you'll often find it as 'Quilt Soap' at the quilt store - see right). If you do not have Orvus, it is OK to use your regular laundry soap, but do try to avoid the optical brighteners. Agitate to mix the soap evenly through the machine. Turn off the machine. Open your quilt fabrics (this helps to prevent setting the fold) and distribute them evenly throughout the washing machine. Turn on the machine and complete the washing cycle. Tumble dry on low removing it from the dryer while it is still slightly damp. You can skip the dryer altogether by either line drying or laying your quilt fabric out flat to dry. If you will be using your fabric immediately, then iron. If these fabrics are going straight to your stash, just fold neatly for now. Remember to press before you use them. Pressing only once saves time. The trick is to lay them slightly damp, fresh from the dryer, flat immediately to avoid setting in wrinkles. Remember, prewashing DOES NOT ensure it won't bleed. While the majority of commercially printed fabrics today do not bleed, it's the one that does that makes you cry. 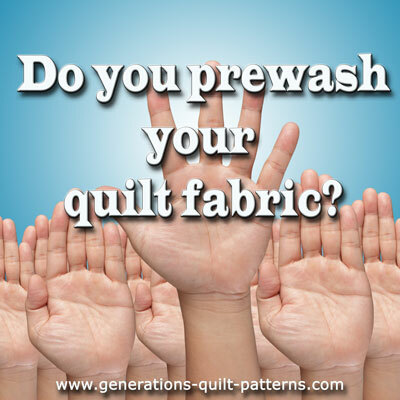 To prewash fabrics for quilting is a personal decision that you, alone, make. Make it an informed choice!